Access the online version of the G4S job application via the links posted on this page. Learn how to navigate the G4S employment site by following the instructions in the guide posted below. Numerous types of careers can be applied for across several different regions/countries. The below guide details the online job search and application processes for applicants in the United States. 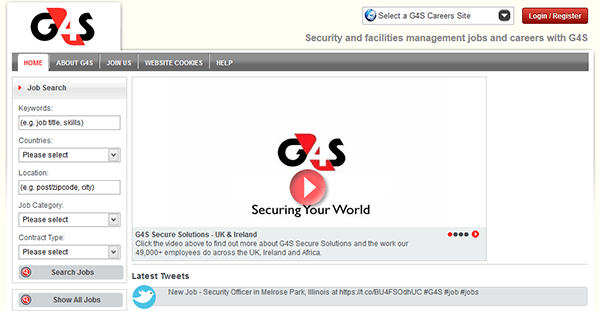 About the Company: G4S is a British security company based out of Crawley, England. The company was founded in 2004 and currently operates in more than 100 countries across the world. G4S has more than 600,000 employees, making it one of the largest private employers in the world. 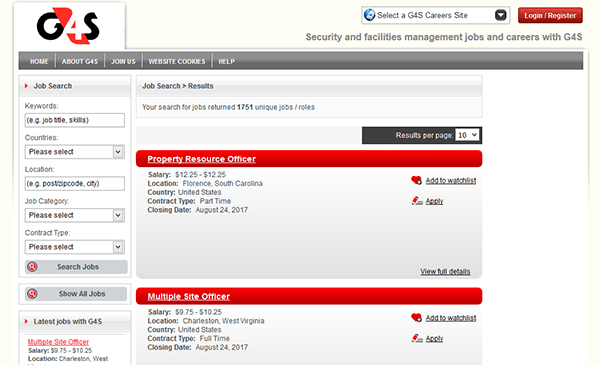 Step 1 – Click here to open the G4S employment site in a new tab or window within your current web browser. Step 2 – Scroll down the page and press the “Visit the Careers Portal to find out more” link (to go to the company’s main job search site). Step 3 – Use the “Job Search” form on the left side of the page to search the main listing of current openings. Enter a keyword into the first input field, select a country (e.g. “United States”), and then select a job category/contract type. Click the “Search Jobs” button to load the results. Step 4 – Click the link of the position that you want to learn more about/apply for. Step 5 – Read the complete job description and then press the button as shown in the screenshot. Step 7 – Click the “I Agree/Create” button near the bottom of the form to complete the registration process. After your account has been created you will be able to continue/complete the application process.